Win tickets to see Simone Biles, Max Whitlock, plus many more at The Superstars of Gymnastics! The 2018 English Championships took place at the start of the month, between the 9th and 11th of February. The competition was held in a new venue in Essex, at the Redbridge Sports and Leisure Centre. 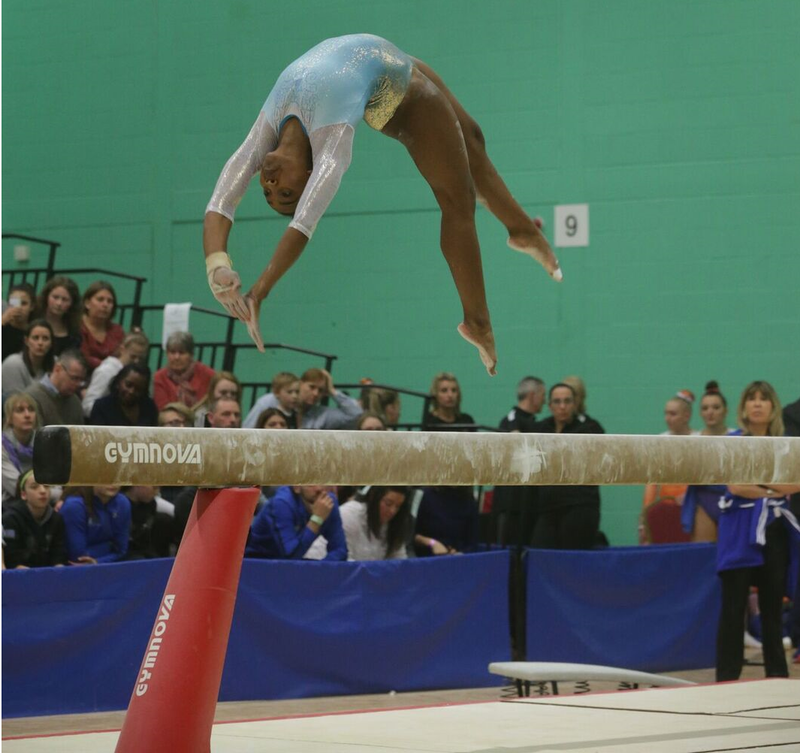 Annabel Agba competes on Beam at The English Championships. This year’s championships held even greater importance than usual for our Senior gymnasts, as the competition also acted as the final selection trial for April’s Commonwealth Games. With a score just two tenths ahead of Claudia Fragapane, it was Amy Tinkler who clinched the gold medal. Amy also won Vault and Bars, whilst Claudia topped the Floor rankings. The Beam champion was Georgia Mae Fenton, who also took the bronze all around medal, 0.35 ahead of Kelly Simm. Ellie Clements (The Academy)- The Beth Tweddle Bars Trophy (Women’s Senior) for having the highest execution score. One week after the English Championships saw the 2018 Welsh Championships take place in Cardiff. Latalia Bevan (St Tydfils) took the Welsh title, as well as the highest score of the day with her 13.800 on Beam. Last year’s winner Jolie Ruckley (Cardiff Olympics) placed in second and Emily Thomas (Pen-y-Bont) finished third. This past weekend (February 24th-25th), the 2018 Scottish National Artistic Championships were held in Perth. In the Senior competition, Cara Kennedy (City of Glasgow) took the Scottish Championship title, Isabella Tolometti (Garioch) won the silver medal, and Shannon Archer (City of Glasgow) won bronze. The English Team, made up entirely of Great British international squad members who have a wealth of competitive experience between them, will likely be the favourites to win the 2018 Commonwealth team title. Claudia Fragapane will also be the subject of much attention at the upcoming games, after she rose to fame with an historic 4 gold medal sweep at the last Commonwealths. She is certainly capable of retaining these titles but faces stiff competition, even from within her own team. March will bring two of the most highly anticipated competitions to be held on British soil. First the British Championships, held in the magnificent Liverpool Echo Arena, will take place between the 8th and 11th of March. The British Championships never fails to be full of surprise and delight, as the gymnasts pull out all the stops to battle for those national titles. Internationally-competing gymnasts also often take the opportunity to showcase their newest skills and routines at the British Championships, and test them in a big arena setting. It’s not one to be missed! Two weeks after the British Championships, on the 21st and 22nd of March, the 2018 World Cup series will visit Birmingham. The World Cup series consists of four competitions, held in four different locations. Gymnasts who compete in all four are eligible to win both special awards and prize money, if they top the aggregated rankings. This year’s event in Birmingham will be the third event in the 2018 series, then the competition will finish in Japan. If you can get tickets to this competition, you’ll certainly be in for a treat. I managed to catch the event at the O2 arena in London last year and all the participating gymnasts (who, by the way, must be ranked among the best in the world, and get to compete in the series by invitation-only) were absolutely excellent. Seeing international stars live, versus on the television, is a far more exciting experience! You’re now all caught up with February’s highlights and what to look out for in March. Visit the Zone’s blog again in the near future to read more about some of the competitions I mentioned, including the British Championships and Commonwealth Games. © 2018 The Zone. All Rights Reserved.